That would be a snake in my pool area. 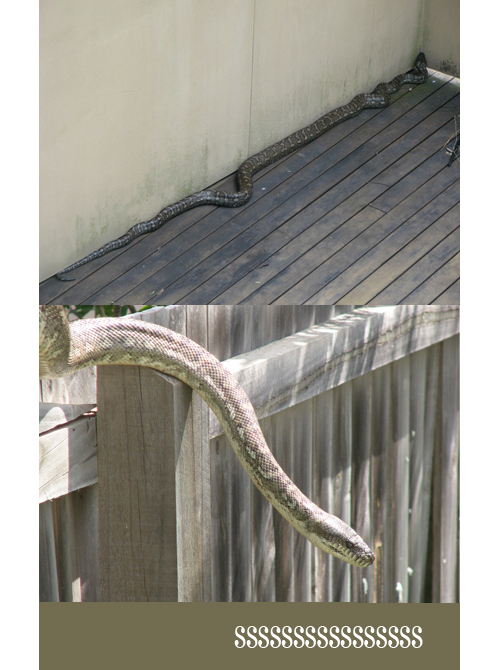 Now contrary to popular urban myth, snakes don't live in every Australian backyard. But they do like to visit some once in awhile. We live in the city, but on the edge of bush area so it isn't a great surprise to see this 3.5m (11 feet?) snake sliding its way through my garden. The kids were mesmorised, once they got beyond their fear. In order for me to be able to let Kransky the super dog into the bakyard again, I had to call someone to take her away. I'm hoping I won't see too many more of these as the weather heats up. Edition: And just to add some info about this lovely lady. She is a carpet snake (python). Non venomous. I wouldn't be that happy to have a death adder or brown snake in my back yard.....but my sister in law who lives on a property does!!! Thanks to all of those who have entered the giveaway below and the lovely comments you have made. I wish I could make one for all of you. Today, one of the many things I have been busy doing is designing some cards for a local craft shop. Trying to get some ideas out. I have come up with these, but I think I still need to do some more exploration. Have to say I'm having lots of fun working with a new theme. I can't knit, only crochet but one day I might try to learn. 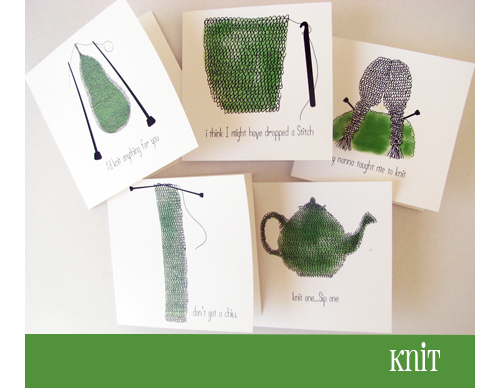 For now I'll just stick to making cards about knitting. These and some others are now in the shop. My shop too! 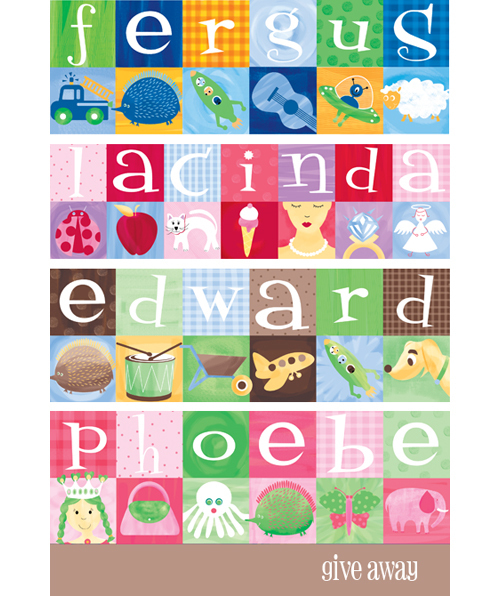 3 years ago I decided to design personalised images for some friends' babies as gifts. What followed was a desire to make more in between nappy changes and to keep my creative juices flowing so I didn't become a batty housewife. SInce then, my ABCme personalised art on paper and canvas have really kept me busy and I have had people from all around the world buying them. It has been a wonderful little adventure. But now it is time for a shift in what I want to concentrate on. I'm not going to stop making them just yet, I've just decided to readjust a few ideas. I am about to change my website again, as it is clunky, and contains too much information It has been driving me insane for so long, but simply I haven't had the time to sit and maintain or update it on a regular basis. Every time I go there I shake my head with shame! So by the end of the year, there will be a few changes. That is if my internet connection improves. I have had such trouble with it over the last few days. But this is another story! As a way of recognising this little growing thing i have been doing, I am going to be giving away a personalised artwork on paper. Simply leave a comment or email me your interest. I will then draw out a name on Tuesday 4th September and will be in contact with you to get all the information about the child's name, colours, images you would like etc. If it isn't for your child, you might want to have one made for a friend. And not to leave out the non english speaking part of the world, if you would like an ABCme for a special little friend in your native language, I am up for a challenge. So for example, if you are Italian and want a cat for the letter G (gatto) then I'll give it my best shot. Finally it is raining! YIPEE. Both Mr A and Miss M have never seen so much rain in such a short amount of time, well maybe Mr A as a baby. Everyday we venture out and they look for puddles to jump in. One of those simple things in life that brings pleasure is watching a child get such joy out of jumping in water. So we will be spending the weekend at home. Kransky is hoping he'll get a walk at some stage. 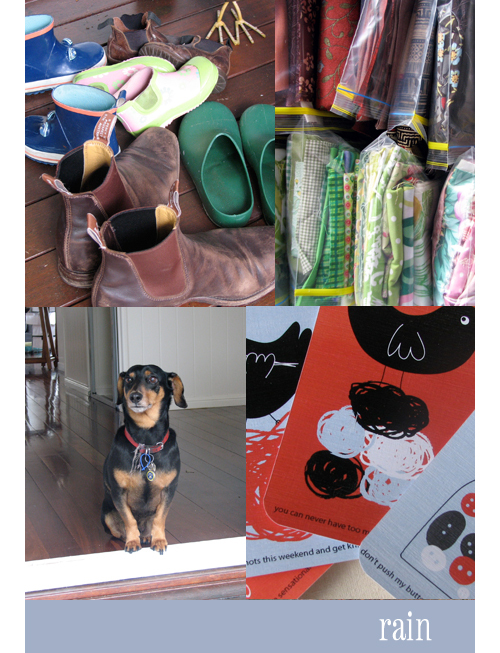 I'm working on so many things, cards, gifts and quilts and sorting out my fabric stash. Enjoy your weekend. Recently I have been busy selling some works for a gorgeous retail shop in Adelaide.Look closely on the table for some of the images. One small room just looks wonderful. 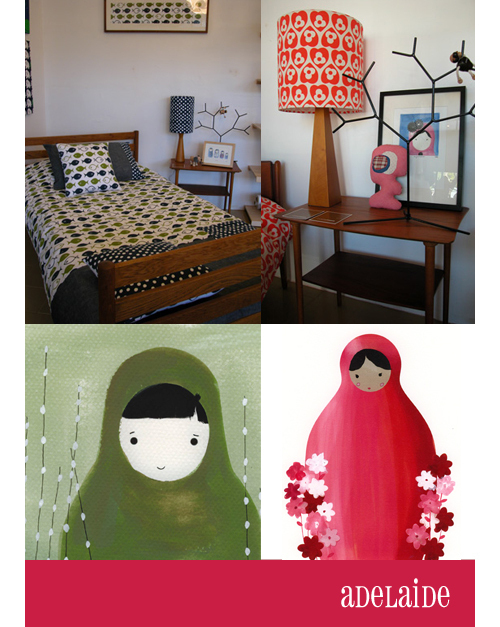 You might recognise some products from some other talented Aussies too. I haven't been to Adelaide since I was a child and would love to visit there again. My husband is going next week....trying to twist his arm that the kids and I could go too..we wouldn't be in the way..honestly too much sightseeing and shopping to be done. However I don't think it will happen. I can't seem to organise a weekend away at the coast, let alone a trip interstate. whilst driving to kindy the other day, Mr A got upset because he didn't like his quilt in his sheets bag. It was one my mother had made when he was born. Seems to be that when you are almost 5, things become uncool! With tears flowing, I found mother guilt slowly sinking in and by the time we had turned the last corner of the street, I had somehow 'promised' I'd make him a new one.....one with MONSTER TRUCKS on it. What was I thinking? You see, monster trucks are BIG in our house, well for Mr A they are. So after some thought and a rummage through my fabric stash I had a plan. And with the speed of a formula 1 racing car, we made a quilt. Yes WE. You see, he really wanted to help. 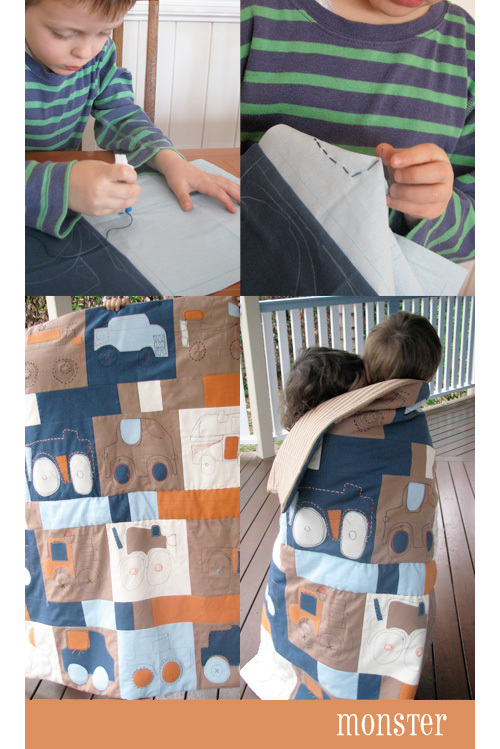 So I let him draw the trucks on the fabric and hand sew parts of them with some coordinating thread. He wanted to have all sorts of colours , but I took some control here. Then with my free-motion foot on my machine I sewed around his lines and added some patches of colour. With a bit of hand sewing from me to finish, the top was completed. And with much luck, I had the perfect sized wadding and some mattress ticking fabric to complete this monster of a project. In the end I made a decision not to bind the quilt. I turned it instead (not sure what the technical term for this is). But I decided that I could spend the rest of the afternoon in my pjs hand binding this thing or have a shower and do something for me...after all it is Sunday. 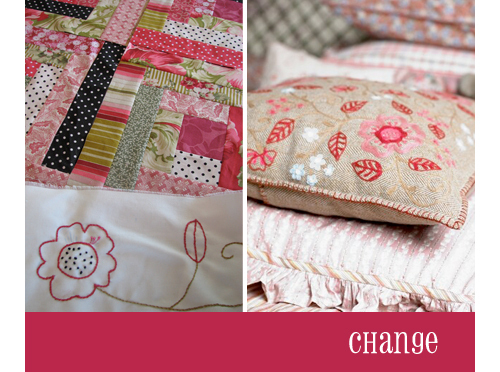 This little project has come out a mother's guilt for a child's devastation of not having a cool quilt. I'm still shaking my head that I was so easily persuaded to do this. Call me selfish, but I kept on thinking as I was sewing away of all the things I could be doing instead. But the look on his face when each new step was completed and finally at the end when he snuggled under it with MIss M made it all so worth it. Miss M has put her order in for pony or mermaid quilt. But I already have started something a little more sophisticated for her......more soon. I live in an environment surrounded by thousands of trees and just as many birds. Some of them come very close to the house. Minor/myna birds, kookaburras, white cockatoos, butcher birds, pheasants, scrub turkeys, crows, rainbow lorikeets, currawongs, magpies and willie wagtails. I'm sure there are many more I don't know the names of. I guess you can say they are an influence. Life seems to be full steam ahead here at the moment. I don't feel like I have stopped to smell the roses in weeks. The crazy thing is, I'm loving it. I been very busy with orders and ideas. 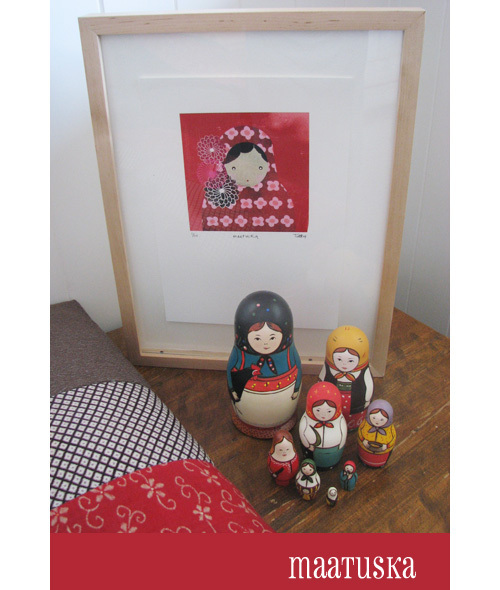 These nesting dolls sitting ever so still for a photo are apart of a limited edition series called 'Rooster Girl'. (not mine) Based on an original set that represented a peasant family. I love the simple design and the subtle, earthy shades used for decoration. Some nesting dolls can be so over the top. I've been waiting for the mail to arrive for a few items. Yesterday I received a couple of items, and I'm crossing my fingers that some more things will arrive today before the weekend. I purchased this fabric from Azalea Studio. Thinking of making some cushion cover for Miss M's room. And this by far is my most expensive but most treasured Etsy purchase. I'm in love with this Kokeshi doll, and she looks just right with my other little purchase. Now I wish I could purchase some of Danny Mansmith's bags. Have you seen his work? He has a little shop too. I'm fascinated by his organic use of embroidery. 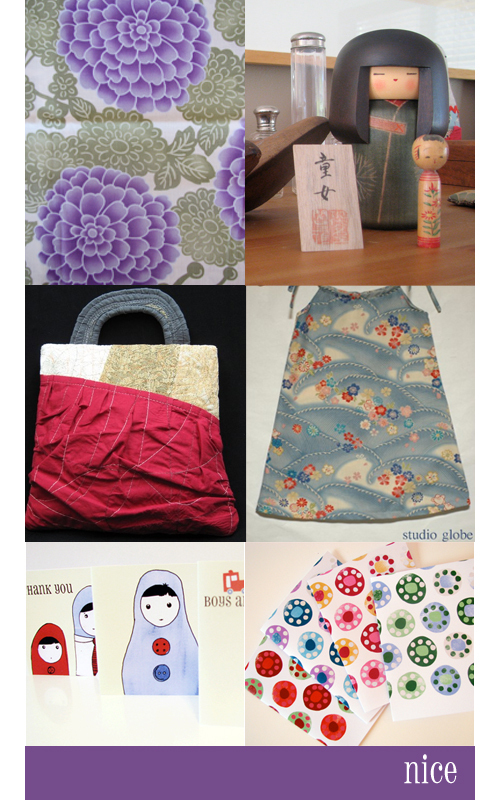 And if you are after some cute dresses or pouches, Studio Globe is another great find. I've been a little busy to with orders. 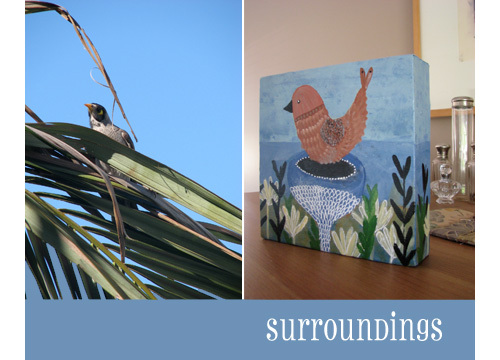 I have made some more greeting cards and hope to add some more artwork into my shop soon.